With some basic preparations Oscar and John were ready to leave for the long trip going directly from St Martin to Bermuda. They left Marina Royale, where Zenitude was docked, timing for the bridge opening on a beautiful afternoon. They were a crew of two with John in charge to teach Oscar how to handle the sails. Oscar, having always been captain of motor boats needed now to get up to speed in the matter of handling a boat under sails. It took seven days to make the 900 miles to Bermuda. The weather was rough at times or completely calm with no wind at other times. As expected it took a couple of days to get into the rhythm of night watches. When they were half way on the trip Oscar started to be very conservative with fuel consumption not really knowing Zenitude's performance under engine. A bit late then, but he realized they should have left with extra jugs of fuel to be able to keep going at ease when the wind died. After 7 days at sea, Zenitude arrives in Bermuda at the same time as a front that hits the island. Fuel management paid off, during the last day they motor sailed under strong NW winds to do the westing needed to reach Bermuda, hoping to get there before the front. They just about made it but had to face 35 knots wind in the cut when entering St George Harbour. 03/05/06 12:00 30 47.40N 63 03.27W 796 Front shifting to NW. Lite winds, SW 15-18, 2nd larger front with 302KTS gusts settling to 15-25 from W.
04/05/06 12:00 32 22.80N 64 40.60W 914 NW winds 15-25KTS Motorsailed to make Westing. Arrived Bermuda 38 KTS in Town Cut. Finally, Zenitude rests at the town docks. What a lovely island! It combines nature and culture with clean, safe beaches in a sub-tropical environment. Oscar was amazed at how nice and friendly people of Bermuda are. Everyone he passed would smile and say 'Hello Sir', even the man cleaning the streets. In the meantime, I was in New Jersey checking our mail. I got the papers with the insurance policy for this first trip of Zenitude. I was shocked to see the policy covered a trip St. Marin/New York, excluding Bermuda plus the additional requirement of having a crew of 3. The bottom line was, Zenitude was not insured for this trip. After a quick chat with the broker, Bermuda was included in the policy, as this had been the original request, but there was no way around the number of crew required. It had to be 3. There was no doubt what needed to be done. I caught a plane and some hours later I was happily arriving in Bermuda to join the crew and make up for crew member number 3. The plan was to leave Bermuda next day at sunset, there seemed to be a window and John was in a hurry to get back home. With that, I joined the crew in Zenitude for the second part of this first trip. The 400-year old town of St George has been declared a World Heritage Site, its surrounding forts are a focus of authentic, colonial architecture in the New World. Its bright buildings are laid out in a narrow maze of streets with names like Old Maid's Lane and Featherbed Alley. The slide show below shows some of the beatiful buildings and places. Bermuda is one of the most popular offshore destinations for sailors on the US East Coast and a frequent stop for boats sailing between North America and the Caribbean or Europe. Once they entered the harbour they found a space in the city docks, which are free for all cruisers that arrive to this beatiful port. We spent a nice day in Bermuda getting fuel, weather maps and talking with other cruisers about the next days' weather. It was not a very firm window but the first 3 days looked good enough for the trip. Zenitude did not have good communication gear and we were counting on SSB radio contact with Herb on Southbound II for weather forecasts. After farewell drinks with newly found friends we left the docks and started our crossing just as the sun was setting in the horizon. 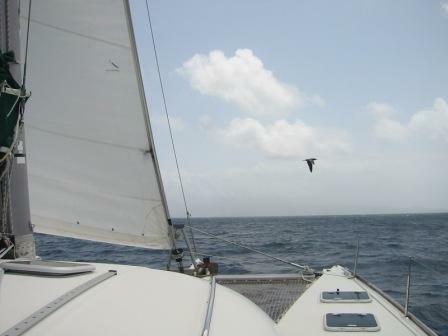 This was my first long passage on a sailboat and as Bermuda's coast line started to fade away I had a strange feeling while wondering what on earth was I doing here. But soon after the feeling was gone and I got into the cruising mood. During the first part of the trip we had relatively good weather. On the third day at sea we lost communication on our SSB and were left without any weather information from this day onwards. We crossed the Gulf Stream in nice and calm weather. On our 5th day at sea we run into a really bad storm with over 40 knots wind and 18 foot seas. As the storm hit and the wind suddenly changed we lost the shackle that was holding the preventer with a big bang. During the worst part of it Oscar and John had to take turns on the helm as the autopilot would not hold. It was cold and miserable and I had never been so scared at sea before. For me the worst part was not knowing what it lay ahead in terms of weather as there was no way to get an updated forecast. After about 12 hours of bad weather the wind and seas started to calm down. We were now close to Long Island shore and a very bad fog started to appear as we were getting close to the continent. Visibility was next to nothing and we transited the big ships route into New York harbour guided just by our radar. At this point we decided we wouldn't attempt to enter New York and headed towards New Jersey's shore, to a marina known to John. After grabbing a mooring at the marina, everything all the sudden was so quiet and still, a beautiful night. We finally could relax, all our fears and troubles quickly forgotten. We made it, our first passage completed. Next day, on a beautiful Saturday morning, we left the mooring in Sandy Hook in New Jersey and sailed up the Hudson River to our final destination, a berth at a marina in the New Jersey side of the river. It was a happy and slow trip with Manhattan on our starboard side, feeling all the excitement of the end of the first trip and the beginning of our new cruising life. This was the first time we crossed under the Verrazano bridge, sailed along side the Statue of Liberty, passed Hoboken and entered our berth in the marina, right across the Empire State building. For the next 6 months, this was going to be our home.